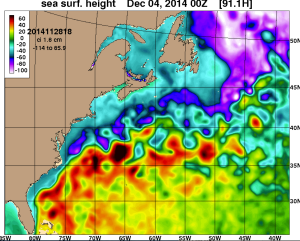 Home » Sailing » Extreme Sailing » How Best to Cross the Gulf Stream? 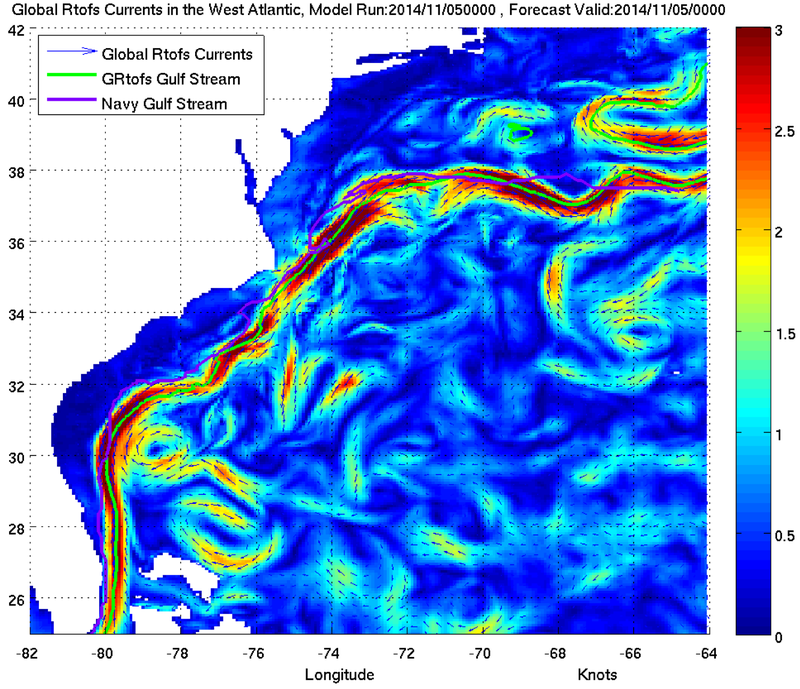 Navigating the Gulf Stream is a special part of charting our course for the Caribbean. Since we are leaving from Charleston, one of the questions we face is do we head straight out on a southeasterly course, which will take us across the gulf stream where it’s wide, strong, meandering, and known for eddies on the eastern side, or do we head down the coast inside the gulf stream to around 30N, and then head across the Stream there, where it is normally narrower and weaker? The latter course will add about a day to our course, but is the more conservative choice. The Gulf Stream is a very strong (3-5 mph) ocean current in the western North Atlantic Ocean that stretches from the Americas to Europe. “The Gulf Stream transports nearly four billion cubic feet of water per second, an amount greater than that carried by all of the world’s rivers combined.” From the Caribbean, the stream flows generally northward along the east coast of the USA from Florida to North Carolina, and then it veers out into the North Atlantic through the narrow Straits of Florida. The Gulf Stream then continues to roughly follow the contours of the eastern coastline north as far as Nova Scotia and Newfoundland. The water in the gulf stream is warmer than the surrounding water as it heads northward. It’s also a deeper blue. Another consideration are the eddies that exist on the eastern edge of the gulf stream southeast of Charleston. There is a “Charleston bump” associated with the under-sea Blake Plateau, which is southeast off Charleston, resulting in changes to the gulf stream. They even have a name for it: the “Charleston Gyre.“ Warm water eddies are often seen north of the stream, and cold water eddies develop to its south. Warm eddies circulate in a clockwise direction; currents around cold eddies are counterclockwise. We could try to position Golden Glow in that portion of an eddy that favors rather than opposes our course line, taking advantage of up to a knot per hour boost in speed, but I don’t know that we’ll be able to chart our course with this much precision off of gulf stream maps that are a few days old. No matter where we cross the gulf stream, we know that careful planning and proper safety precautions are essential. The foremost consideration is wind direction and velocity: any wind from the south under 15 knots is ideal; any wind from the north over 15 knots is dangerous, creating short, steep waves that can be treacherous. These winds can result from a low-pressure system, passage of a cold front, or interaction between high and low pressures. Swift currents running directly against swift winds magnifies the wind force and creates taller, steeper, breaking waves with a very short wavelength. 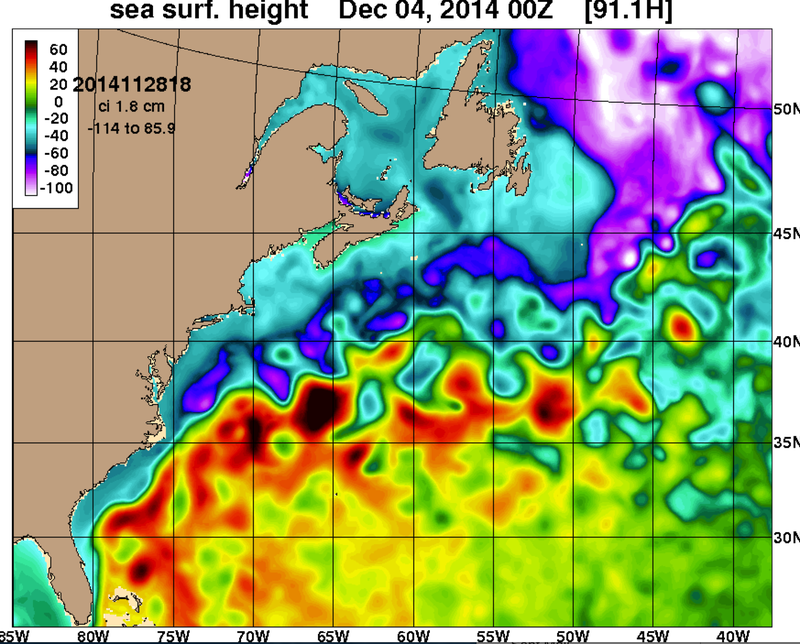 The gulf stream is also where you are more likely to encounter dreaded “rogue” waves. Because the gulf stream forms a boundary between the warm waters of the Sargasso Sea and the colder, denser waters along the continental shelf, the stream is known for making its own weather. In fact, one of the ways you know you’re approaching the Stream is watching the skies above it. Often you’ll see cumulonimbus clouds above the warmer water of the gulf stream if there isn’t a strong gradient wind, and sometimes there will be fog above the warmer water, and below the cooler upper air. Sometimes, you’ll see the thermals in the gulf stream – rising cloud banks that are a result of the warmer water and rising air. One of the challenges of crossing the gulf stream is its width. Generally, the gulf stream is roughly 100-200km wide (30 miles near Florida to 80 miles wide further north) which means that crossing it takes time, and this challenges weather forecast tools and makes it more difficult to predict weather over the stream before you leave port. When we sailed north along the eastern seaboard this summer, the gulf stream provided us a lovely warm current that sped us on our way. Heading south in the winter, however, is another matter entirely. 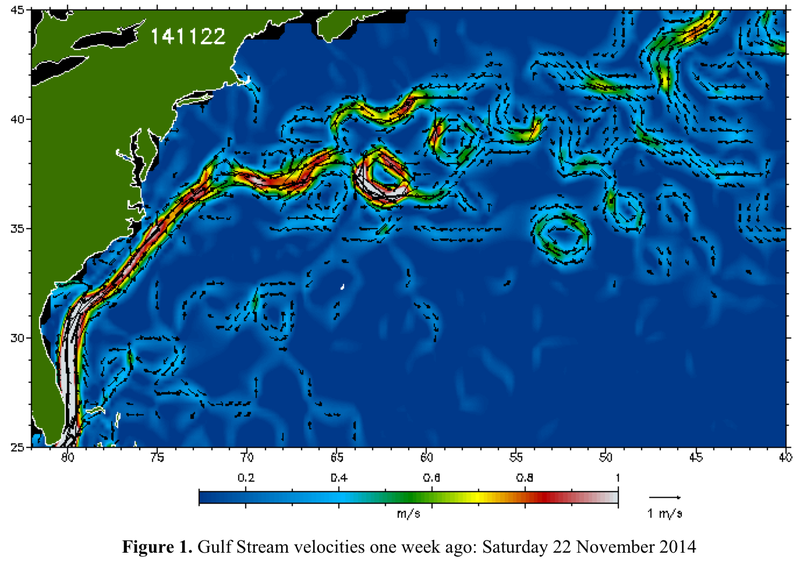 The potential gravity of crossing the Gulf Stream became more apparent to me during a seminar we took during the Boat Show in Annapolis in October. Lifelong sailor, Frank Bohlen, Professor Emeritus of Oceanography at the University of Connecticut, taught the class and I had the chance to chat with him afterwards. He heard our plans to sail from south from Charleston in early December and he advised me to sail south inside the stream to around 30N and then head east because the stream there was narrow and weak. Don Street, who also taught a class at the Boat Show, also recommends this route. It may make sense to me to cross at the narrowest point within a reasonable distance of our course line, and to make good speed while doing so to lessen the current set and to get across before inclement weather can develop. Off to discuss this with Rand! Jennifer Clark, an oceanographer, was NOAA’s gulf stream expert. Now, Jennifer uses infrared imagery, satellite altimetry data, and surface isotherm data, oceanographic analyses to produce guidance for private customers on how and when to traverse the stream.